Norman Fischer reviews the Fortieth Anniversary editions of two modern classics. Like many young Buddhist practitioners in the 1970s, I read these books again and again when they first appeared. 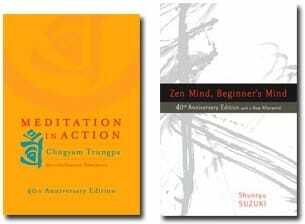 Shunryu Suzuki’s Zen Mind, Beginner’s Mind and Chögyam Trungpa’s Meditation in Action were not like anything I had read before. Suzuki Roshi and Trungpa Rinpoche were neither literary magicians nor spiritual tricksters. Their teachings did not sound exotic or exciting. Instead, they spoke directly, in a no-frills way, about the liberating truths they had discovered in their own practice—and that we too could discover. Yet the truths they spoke of seemed essentially elusive. I read the books with the odd sense that I understood immediately what these great masters were talking about—yet, at the same time, that I was continually baffled. 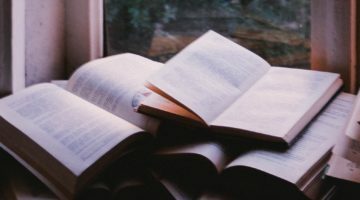 Though the experience of reading Zen Mind, Beginner’s Mind and Meditation in Action may not be the same forty years later as it was then, both books have remained in print since their original publication. Both have continued to be read with a sense of discovery, decade after decade. Both are simple, brief, informal texts that express the first powerful blush of the transplantation of the Buddhist teachings in the West. It is no accident that neither text was actually written by its author. As David Chadwick mentions in his excellent Afterword to the new fortieth anniversary edition of Zen Mind, Beginner’s Mind, Suzuki Roshi, on seeing the first copies of his book remarked, “Looks like a good book. But I didn’t write it.” Both books are edited transcriptions of intimate talks given to committed students. 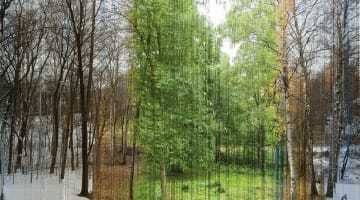 In a very real sense, they are collaborations between teacher and students. Although both teachers were already experienced masters of their respective traditions, they were rediscovering those traditions through their encounters with Western students, whose innocent preconceptions, however confused, inspired the masters to new ways of seeing and expressing what they had long ago digested in another context. It is also quite significant that both teachers spoke the texts of their books directly in English. They were literally discovering a new idiom as they spoke. When Meditation in Action first appeared in 1969 (Zen Mind, Beginner’s Mind following in 1970), there was already a small but potent literature on Buddhism available in English. Alan Watts’ lively Zen books were bestsellers, and the literary works of Philip Whalen, Gary Snyder, Allen Ginsberg, and Jack Kerouac made Buddhism culturally current. D.T. Suzuki’s works of Zen philosophy were enormously influential, and Philip Kapleau’s Three Pillars of Zen established that Westerners could practice Zen. Walter Evans-Wentz and Lama Govinda wrote of the magical side of Tibetan Buddhist culture. Yet all these works in one way or another assumed an “exotic wisdom of the East” stance; none came out of an on-the-ground involvement with Western students practicing in the West. By 1969-70, both Suzuki Roshi and Trungpa Rinpoche were deeply engaged in Western practice centers. This made their books completely different from those that preceded them. They necessarily presented Buddhism as ordinary daily practice, rather than idealized doctrine, philosophy, or mysticism. Both teachers knew enough about their students to teach to their condition, and to want to puncture their romantic projections. And both presented basic, nitty-gritty meditation practice as foundational. Chögyam Trungpa Rinpoche was born in 1940 in Tibet. 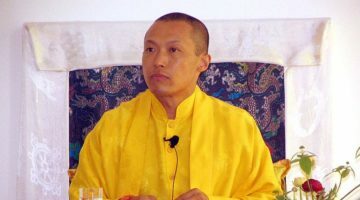 Recognized as a reincarnate teacher when he was thirteen months old, by the time he was a teenager he was head of a large monastic establishment. With the Chinese Communist takeover of Tibet in 1959, he fled to India, and from there went to Oxford, where he mastered English, Westernized, and later disrobed. An exceptionally brilliant young man catapulted into a jarring new world, he was quite wild, interested, and ready for anything. He brought that wide-open improvisational spirit to his teaching and practice with Western students. The pages of Meditation In Action bristle with a sense of discovery and youthful daring, as if Trungpa Rinpoche were taking apart what he’d learned in Tibet and putting it back together again for and with the students who had come to him. Suzuki Roshi was a much older man who’d spent his life as an ordinary Soto Zen priest in Japan. Born in 1904 into a temple family, he too was steeped in Buddhism from the beginning. Suzuki’s monastic training at Eihei-ji, the headquarters temple of the Soto sect, had lasted only a short while because he needed to return home to tend the family temple. He had studied at a Buddhist university with leading Soto priests who were exploring the writings of the sect’s founder, Eihei Dogen, with an emphasis on how Japanese religion could meet the challenge of the modern West. Suzuki Roshi had studied English early on, and dreamed of a chance to go to America, where zazen practice as Dogen described it might interest people. In 1959 he accepted a temporary position at a temple in San Francisco’s Japantown (not a good career move, from the Japanese point of view). He remained in America for the rest of his life, eventually leaving the Japanese-American community to found the San Francisco Zen Center. Like Trungpa Rinpoche, Suzuki Roshi’s teaching was improvisational and experimental, though in a far less dramatic way. Outwardly he was quite conservative. He seems clearly to have been inspired and amused by his young students. Both Suzuki Roshi and Trungpa Rinpoche realized that the transfer of dharma to the West would require that Buddhism itself transform—and that this was a good thing. Both had a keen sense of the historical moment. This feeling is clear in every page of the books. Before Suzuki Roshi and Trungpa Rinpoche, a few Buddhist teachers had begun Western groups but nothing had stuck. After them the way was clear for many new and successful groups. The communities they founded—the San Francisco Zen Center and its lineage affiliates and the worldwide Shambhala communities—remain among the largest and most important Buddhist groups in the West. The two teachers knew and appreciated each other. Trungpa Rinpoche made an early visit to Tassajara, the Zen monastery Suzuki founded in 1967, and found in the older man an echo of his own Tibetan teachers. He said it was a great relief to meet such a wise and mature master who felt that practicing Buddhism seriously with Westerners was actually possible. Returning home, Trungpa Rinpoche adapted some of the Zen customs he learned from Suzuki Roshi, and put the roshi’s picture on the altars at his practice centers. For his part, Suzuki was deeply sympathetic to the young Tibetan, and despite the solid, almost monotonous quality of his own practice, appreciated the exciting flash and brilliance of his young colleague. In the early 1970s, when I began to practice Zen in San Francisco, just after Suzuki Roshi’s death, Trungpa Rinpoche often came through town. Many of us from Zen Center would attend his talks and some traveled to Boulder to meet him, a few remaining to become his students. Although many of the Asian teachers of that time (and today) felt that it would take many generations for Westerners to understand Buddhism, and so carefully named Asian successors, it was a key point for both Trungpa Rinpoche and Suzuki Roshi that their successors be Westerners. Both chose charismatic and able Western leaders to follow them, and in both cases the organizations continued successfully for some years, only to eventually experience painful upheavals that resulted in the dismissal of both successors. Looking back on this now, with a forty-year perspective, it seems that these tumultuous transitions were probably inevitable. How could the subtle transmission of a religion across such a huge cultural divide not entail troubling complications? And how could the loss of two such extraordinary men, in these circumstances, not be traumatic? But both sanghas matured and strengthened as a result of the tragedies, and are now, perhaps more than other Western sanghas, naturalized in their cultures. Many readers of the Sun are probably familiar with Zen Mind, Beginner’s Mind. Its editors, Richard Baker and Trudy Dixon, carefully organized Suzuki Roshi’s easygoing talks into three main sections (Right Practice, Right Attitude, Right Understanding), with about a dozen short, titled pieces in each section. Each piece is preceded by a short quotation lifted from the body of the piece, as if the title and the quotation were a summary of it, but this is never really the case. Suzuki Roshi’s words seem to meander naturally, without topic sentences or consistent argument. The book does not follow traditional teachings nor comment on traditional practices. Suzuki Roshi seems to be musing out loud to his students about life and practice, and yet there is a sense of direction and determination. Zen Mind, Beginner’s Mind is almost uncanny in its ability to surprise and delight. Sometimes I think I know the Zen teaching Suzuki Roshi is referring to; other times I am stopped in my tracks—What! Where did that come from? The book’s oddly paradoxical nature (though Suzuki doesn’t make a point of this, it is always present) flows naturally from his nondual teaching. There is no goal and no means. Enlightenment and the path to enlightenment are the same thing: practice is enlightenment, and practice/enlightenment is life. So practice is not as much something to do or hold in mind as it is the letting go of anything to do or hold in mind. Meditation in Action seems on the surface to be a much more pointed and organized text. It is divided into seven chapters with straightforward descriptive Buddhist titles like Patience, Meditation, Wisdom. Each chapter seems to be about its intended topic, and more or less is. But like Suzuki Roshi, Trungpa Rinpoche is always making the point that what you think is wisdom, or patience, or meditation, isn’t what that thing actually is. Practice, he is saying, isn’t something that gets you from point A to point B. Maybe you aren’t at point A to begin with, and the point B you think you are aiming for probably doesn’t exist anyway. In Zen Mind, Beginner’s Mind you feel the quiet voice of a kind roshi; Meditation in Action’s voice is that of a sharply intelligent master of the teachings. Oddly, despite the fact that he often uses picturesque stories from the Tibetan tradition, Trungpa Rinpoche’s voice doesn’t sound at all Tibetan. It comes across as the opposite of pious or wise in the conventional sense. It’s sharp, witty, almost cynical, even as it speaks of compassion and kindness. There is an almost aggressive anti-sentimentalism. Both books in their anniversary editions include new Afterwords by students— his biographer David Chadwick for Suzuki Roshi, and Samuel Bercholz, the founder of Shambhala Publications, for Trungpa Rinpoche—who can speak personally to the histories of these great texts and their authors. In many ways, the basic foundational understandings of Western Buddhism were established by the terms and attitudes of these seminal texts, which is why they are as readable and valuable now as they were then.